This delightful bouquet will charm and delight her. 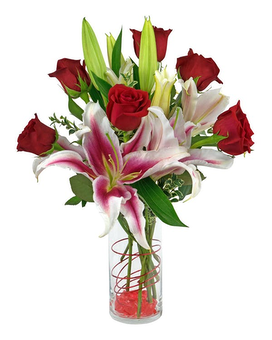 It's six roses combined with stargazer lilies in a cylinder vase, decorated with wire and gemstones. So simple, yet stylish, and very fragrant. It's available with red roses or pink roses, and measures approximately 11" W x 19" H.